When I was little I wanted to grow up to be a mother. I used to dream of a little baby in a cradle next to my bed. I had the most magical feeling of resonance about that being my most wonderful role in life, and I couldn't wait! I knew there would have to be certain other aspects in place before I could be a mom, and although the idea of how wasn't as tantalizing, I assumed I'd get used to it over time. I was so drawn to the world of children. I never was a child immersed in the children's world and actually making merry, I was a child on the outside looking in--agreeing with the ideals in a children's world, but not having the courage to be quite so free. I was always alert, watching for the problems in the world at large, analyzing the contradictions between the adult world and the children's world-- how far apart they were--wondering how I could bridge them, and feeling rather unsuited for the hugeness of the task. Nobody wanted to listen to what I had to say, which was essentially, "We are all going to die! Why can't we all get along?" Yes, I could have used some help on my approach. It wasn't so catchy, but it was pure. And for those of you who've wondered about my focus and consistency?--this is the one thing that has not changed, this is still what I say all the time! I am not even sure my approach has improved much. Oh well. As a child, it was obvious to me that adults had completely lost their way. I noticed that a children's world was full of hope, sweetness, innocence, seeing the world as a magical place, while an adult's world was jaded, pessimistic, stuck and trudging toward the grave. There was more room for self-expression for children, plus allies and wonderful adventures in solving problems--lots of patience for not knowing or understanding, permission granted for asking questions and even being deemed cute for doing so, while the adult world was alarmingly full of miss-steps and travesties of those who had set out to win big, but who had failed, crashed, compromised their integrity, or a combination of all three. In a child's world there was room for emotion, compassion for falling down, for making mistakes and, most importantly, the entire world seemed to be built around the concepts of dreaming and wishing and these becoming realities. Whereas the adult world seemed to be about infinitesimal chances at winning, charity at best, falling through the cracks and losing all of it, falling apart at the seems at the worst. I used to love watching shows where the hero/heroine was a child, who through purity of heart and hope, taught the sour old adults to open their hearts and to remember what was truly important, like in the wonderful Pollyanna. I loved how children could go on wonderful adventures to find love and support along with danger and conflict that would help them to grow. I remember watching these shows, and hoping that adults were listening and getting the important messages. And yet, none of the adults around me seemed to be getting what was most important. They were lost, just like the adult characters in the stresses of living, racing the clock, paying the bills, and mired in internal and external conflict. Now that I am a grown up, I can't help but see how important those childhood dreams were, and besides having kids, I believe I was drawn to the world of children, because deep in my heart that what would heal our world was for us to allow each other as adults to inhabit qualities of children, the ability to learn and grow, to not know, to express human emotions in a much more uninhibited ways, to show vulnerability with one another. I see that part of what I was seeking in motherhood, was for my own little kingdom where my children and I could inhabit childish qualities with one another, a world among ourselves that we ordained as real and true, outside of the current one so wrought with problems. I was beginning to see how jaded the world was, and so perhaps I had romantic dreams of escaping to my own little Utopia with my children, who would see and interact with the world much differently. Of course, I became an adult, enslaved by the same fears that plagued my mother's generation, the need to be somebody and prove my worth, whether through work or relationship, to make something of myself, to obtain security, to chase behind elusive dreams, but not really believe them possible, and to sort out all the many voices. Hardly makes room for any of the childhood dreaming. And yet the world of children is not any less resonant for me now than it was as a child, and my Geronimo! mission is to bring back my little Utopia into my world, despite my fears and adult striving. Last night my girls and I held hands around a candle for our newly instated weekly joy-building. It is sort of improv at the moment, but it looks like a mini magical meeting. We discuss the mundane like chores, school lunches, and schedules, and report on the state of our yard and house, researching planting time for bulbs and wildflowers, supplies for our craft center--the latest a color wheel is needed. We also did some journeying with drums and last week a pink bubble meditation. I tried to loosen the reins when the girls got loud and obnoxious, and started sparring with the other. I tried to just welcome the adult in me that wanted to throw in the towel. Something deep inside me knew that it might be rough riding, but that it wasn't time to get off the horse, not when our connections have been so fragile lately. And what do you know? I found I have an ability for less rules. I have an ability to put one foot into a child's world and to embrace all the unpredictability of it, even feeling it calling me home. This is where I know ushering in a world of resonance will make these ideals have staying power. This isn't just about giving lip-service to the Utopian dreams of the children's world, where they exist only in fantastical stories outside of our experience. This is about letting myself undo and inhabit. 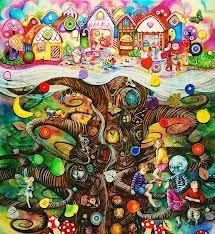 I would like to fully become the dreaming world of children, not just to see that it exists, but know it as a metaphor for a state of being for return. To allow myself to return to a state, which, I think if we were all honest, we would all want permission to reside in, because there, we could all be on different parts of the journey, and everyone would have a wonderful story and adventure to tell. There wouldn't be the heaviness of adult judgment that naturally says the journey has gone awry. Life together would be a whole lot more loving, adventurous, supportive and exciting, as children only get down for so long, before knowing that a way out is just around the corner. I keep thinking how it is we, humans, who, really rather recently, created every single idea that currently exists--yes, money, economy, education, philosophy, theory, theology, politics, culture, laws, habits, trends,WAR, etc, etc. We created all the meaning that goes along with all of it too!! And I just can't help but think, just as it was so obvious to me as a kid, that nothing has to be the way it is. NOTHING. We don't have to believe one iota of what we are told, what experts shout out at us, or what we tell ourselves. To me this is significant how we hide this from ourselves. This is the only way we keep all of it in place. Our lives can be anything we want them to be, if enough of us tip that way. We've seen this happen slowly and quickly through history. But the fact that we would spend so much time stressing about ideas that we are holding in place just by the mere stressing about them...that would be the definition of enslavement to me. And if I don't have a gun to my head, why would I be enslaved? So, my Geronimo!!! will be to allow the world I see to be much more flexible, joy-filled, easy to take care of, as I break down the steps, just as one would for a child learning. I will be much more forgiving of myself and others, and will feel the excitement of a world of possibilities. I will no longer force myself to be an adult. I have never known when that shift happened, or maybe I just didn't get the memo. But it certainly has never resonated, and at the moment resonance is everything to me, as it is where all the meaning of life resides--that zing we feel when we share our experience with one another. I'm taking a leap of faith and believing that adult life can be richer, more productive, more meaningful and rewarding, more forgiving, more exciting and effective, more innovative, creative, more flowing, and breath-filled, when we let ourselves be little children as adults, and just follow where the music takes us. People keep thinking I'm a grown up, when in my reality I just wear bigger shoes now. Beautifully told. Thanks for sharing . Dear Brooke, your "mini magical meeting" with your girls sounds - well, like magic. I love imagining you three sitting around a candle making room for wonder. Thank you for sharing your beautiful self with us. So much wonder, so much wisdom! Thank you, Brooke! No wonder we cringe and cry. No wonder we fret and fear. No wonder we handle the future like a balloon mortgage and the past like a boogieman creeping up on us. We have forgotten the magic. We have burnt the bridge to childhood wonder and freedom. We have traded in joy for expectations, and happiness for desire. We have aborted the moment. Poor moment, waiting for our return—Moment full of God and light—Moment full of possibilities and creativity—Moment pregnant with every good thing.